binning, dumpster diving, narcotics, skip diving, Vancouver B.C. People should always take their old and unneeded prescription medications to a pharmacy for disposal but often they just throw them in the garbage. The latest in a long line of discarded drugs that I’ve found is worth highlighting; it’s a three-quarter-full bottle of tramadol-acetaminophen—plucked out of a dumpster a few weeks ago. Tramadol is a strong, prescription-only opioid pain medication, which (like the opioid codeine) becomes more potent when it’s combined with acetaminophen (aka, paracetamol), the active ingredient of over-the-counter pain remedies, such as Tylenol. 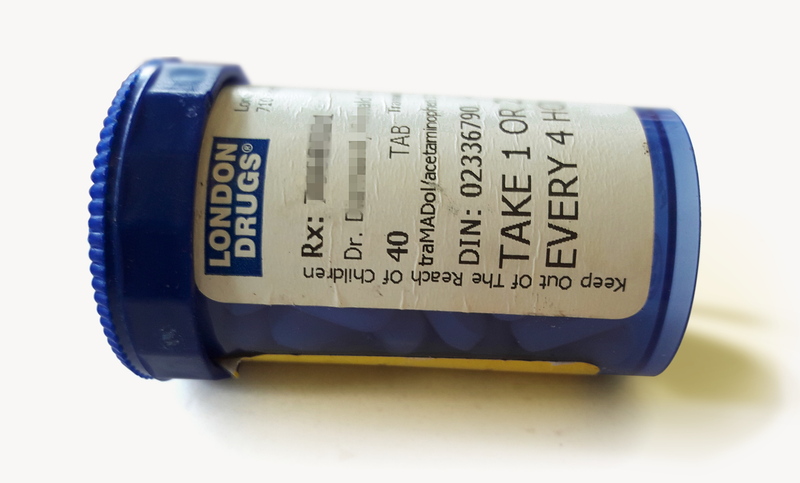 The caplet-style tablets are embossed on one side with “APO”, which is short for Apotex—Canada’s largest producer of generic drugs. The other side of the caplets are embossed with “37.5-325”, which refers to the active ingredients: 37.5 mg of tramadol hydrochloride and 325 mg of acetaminophen. Tramadol is a synthetic opioid that was introduced in 1995 with the expectation that it would be a powerful analgesic with a very low risk of causing dependency. In practice, however, it hasn’t worked out that way. Tramadol is a potent opioid, with much the same dependency and overdose risk inherent with any potent opioid. Tramadol, however, is made even more dangerous by the contradictory information available about it on the Internet. I can’t think of another opioid drug that is the subject of such polarized reporting. For every report describing it as a dangerous overdose risk, there seems to be a contrary characterization of tramadol as a comparatively mild and safe opioid. So a 2011 case study of a single tramadol overdose from the Proceedings of Singapore Healthcare, does not particularly undercut its introductory statement, that tramadol “is considered to have a low abuse potential and [be] devoid of side effects like drug dependence.” At the same time, other reports from 2011 refer to 379 overdose deaths involving Tramadol that year in Florida alone. Unfortunately, it’s impossible to source the above overdose claim. Most overdose statistics, such as those collated by the Henry J. Kaiser Family Foundation lump tramadol in a catch-all “synthetic opioids” category. In 2014, the U.S. Drug Enforcement Agency (DEA) finally classified tramadol as a Schedule IV controlled substance; putting it in the company of drugs like Xanax, Soma, Darvocet, Valium, and Ambien. This at least acknowledged the reality that the drug could be and was being abused. Perhaps the most alarming thing I’ve read about tramadol is not that it can cause life-threatening overdoses but the possibility (noticed in and around 2011) that naloxone—the magic bullet against opioid overdoses, which makes the harm reduction of supervised injection.consumption sites possible—may not, by itself, reverse tramadol overdoses and may actually make them worse by inducing seizures! The bottle of tramadol caplets I found in a dumpster is headed straight for a pharmacy in Vancouver, where it will be properly disposed of. Under the British Columbia Medications Return Program (BCMRP), operated by the Health Products Stewardship Association, all pharmacies across the province accept all surplus and outdated prescription drugs and most over-the-counter drugs. Taking your old and unneeded medications to a pharmacy for disposal eliminates both the harms of accidental ingestion and environmental contamination. Always wear gloves when you dig through a dumpster. That way you won’t get ink all over your hands if you handle a leaky, syringe-shaped ballpoint pen. The sharp-looking pen that I found on Monday (April 30) is embossed with the name and address of Biomed Dispose-It Ltd., a Burnaby, B.C. company which sells a range of plastic disposal containers for biohazards and sharps, i.e., syringes. Here’s some food for thought about the green Play-Doh that I binned last week. According to Hasbro, the children’s modeling material is made of little more than wheat flour, water and salt. Meaning that the stuff is basically raw, unleavened (and brightly-coloured) flatbread dough—edible and with a long shelf life. Ridiculously, Play-Doh only needs a little baking soda and sugar to qualify as bannock—a flat quick bread that countless Canadians, such as myself, grew up being told was “indigenous bread” (to paraphrase) and which many of us made out of flour, water, salt, sugar and baking powder and then roasted (wrapping the dough around birch switches) like hotdogs, over open fires at summer cottages near northern Canadian lakes. Contrary to what I was told as a child, indigenous peoples did not invent bannock; it came to Canada from Scotland, with Anglo-European colonization, over 200 years ago. Similarly, Play-Doh wasn’t always a plaything the way you might imagine. 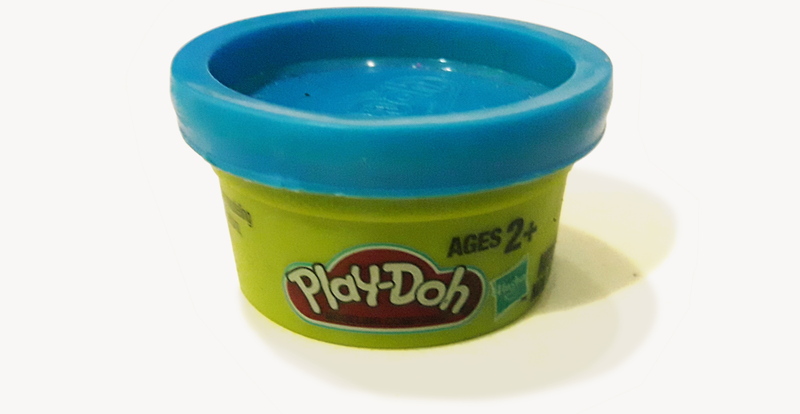 Just as Crisco shortening was invented to make candles and soap, Play-Doh actually started out in the 1930s as a wallpaper cleaner—but that’s a whole other story. Click the images to enlarge them. That’s a lot of digging for info to educate us. Thanks.